I read this article and found it very interesting, thought it might be something for you. The article is called Braces with the Medical Card and is located at https://www.dencaresmilecenter.com/orthodontics/braces-with-the-medical-card/. A common specialty of dentistry, orthodontics is the study and treatment of improper bites, or malocclusions. There can be a variety of reasons why this treatment is necessary, including teeth that grow in an un-natural or crooked manner, jaw alignments that aren’t proportional, or any number of other irregularities in the mouth. The Medical Card, also known as Public Aid, Medicaid, All Kids and Tarjeta Medica, is a form of government assisted health care available to low-income families and individuals in Illinois. Children of low income families residing in all Illinois counties including Cook County, Dupage County, McHenry County and Lake County may qualify for orthodontic treatment with braces coverage under this state funded dental insurance program. Finding an approved provider that accepts coverage for braces in Illinois can be a challenge. Many dentists and orthodontists limit the number of Medical Card patients that they will see or, in some cases, limit the types of services they offer to children covered on the Illinois Medicaid. Orthodontic treatment with braces is available in many cases, but not all and the coverage requirements vary, depending on the age of the individual and the type of dental care required. In general, individuals between the age of 5 and 21 who are Illinois residents, under the age of 21, that have Medicaid coverage are entitled to certain dental services that are considered “orthodontics”. Not all kids covered under the state Medical Card insurance program will qualify for orthodontic treatment with braces. State of Illinois Medicaid administrators must pre-approve all children for braces coverage before orthodontic treatment can begin. We have an experienced team of dentists and support personnel and provide orthodontic treatment with braces for children covered under Public Aid, Medicaid and All Kids in Illinois. Orthodontics or braces are a way to provide a short term treatment that provides long term results, giving you a nearly perfect smile, bringing your teeth into harmony and correcting any functional problems with your bite. Straight teeth are important for several reasons, not just cosmetic ones. 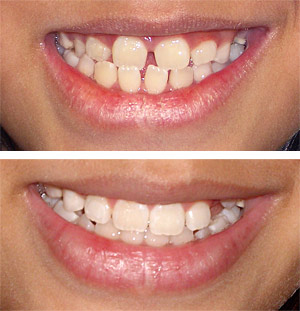 We all want a beautiful smile and having straight front teeth is a key factor in a beautiful smile. But straight teeth are also important for proper health and function. Not only can crooked teeth be a problem cosmetically, but they also can make it easier for harmful bacteria to build up in between the teeth or under the gum line, where it is difficult to remove with brushing. What types of orthodontic braces are available? Metal braces are the gold standard in orthodontic treatment, but they are by no means the only option to straighten your teeth. Today’s orthodontics or “braces”, as they are commonly referred to, are lightweight, comfortable to wear, and can be worn for a shorter period of time in many cases. There are options that are practically invisible, with clear braces becoming more and more popular. Many people think that dental braces are only for children or teenagers, but actually, more and more adults are turning to them to straighten their teeth. Early and Optimal Treatment Times – Some dental health conditions are best addressed while the mouth, teeth and jaw are still developing and early diagnosis can make treatment quicker, easier, and in some cases significantly less expensive. Orthodontic treatment with braces for children is an excellent example of this. Braces can be applied between the ages of 9 and 14, but exactly when depends on the individual child, their particular circumstances and level of physical development. Is Orthodontic treatment with braces right for my child? The first step towards determining if orthodontics or braces are a viable solution for your child’s dental health needs is to consult with an approved Illinois Medical Card orthodontist or dentist and see which of the treatment options would work best for your child. The right orthodontic treatment will often depend on a variety of factors, including what is causing the malocclusion in the first place, how extensive it is, and the age of the patient. In some cases, a simple retainer worn at night will be the extent of the treatment, while others will need a more extensive treatment program. If left untreated, Orthodontic problems may worsen over time. They may lead to tooth decay, gum disease, destruction of the bone that holds your teeth in place as well as chewing and digestive difficulties. Orthodontic problems can cause; abnormal wear of tooth surfaces, inefficient chewing function, excessive stress on gum tissue and the bone that supports the teeth – sometimes leading to chronic headaches or pain in the face or neck. If you are thinking about orthodontic treatment with braces for your child and they are currently covered by Public Aid, Medicaid, All Kids, Tarjeta Medica or the Medical Card in Illinois, we can help. Dr. Gustav Kozina and Dr. Timothy Theobald are licensed providers of General Dentistry, Oral Surgery, Restorative Dentistry and Orthodontic treatment with braces and accept most dental insurance plans including Medicaid, Public Aid, Medical Card, Tarjeta Medica and All Kids in Illinois. Den-Care Smile Center treats patients from Northern Illinois including Lake County, Cook County, Dupage County and McHenry County as well as the communities of Antioch, Arlington Heights, Beach Park, Chicago, Cook County, Des Plaines, DuPage County, Elk Grove Village, Evanston, Fox Lake, Gages Lake, Grayslake, Great Lakes, Gurnee, Hainsville, Highwood, Island Lake, Johnsburg, Lake Bluff, Lake County, Lake Forest, Lake Villa, Lake Zurich, Lakemoor, Libertyville, Lindenhurst, McHenry, Mount Prospect, Mundelein, North Chicago, Palatine, Park City, Rolling Meadows, Round Lake, Round Lake Beach, Round Lake Heights, Round Lake Park, Schaumburg, Skokie, Spring Grove, Vernon Hills, Wadsworth, Waukegan, Wheeling, Winthrop Harbor and Zion. For a complete list of Illinois cities, towns and counties where we provide orthodontic treatment with braces for children on Medicaid in Illinois, please visit our Service Areas page.